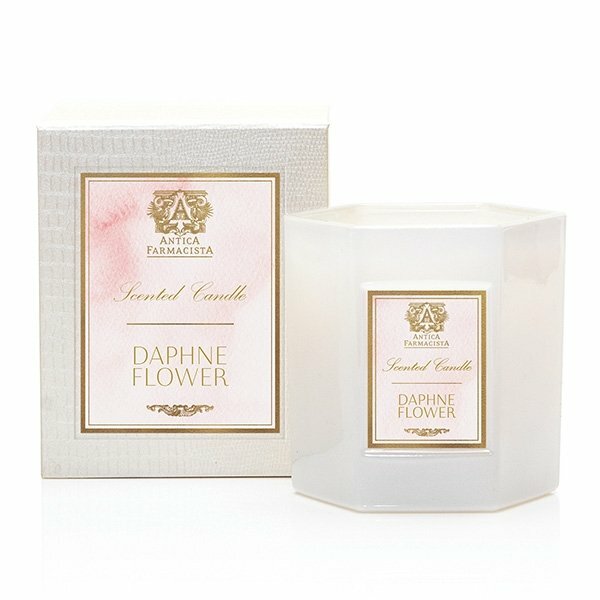 Antica Farmacista Daphne Flower Candle is a bright floral fragrance, inspired by the Daphne Odora flower, found in the Pacific Northwest. Built on notes of effervescent daphne, orange blossom and honeysuckle. Sweet Meyer lemon and dewy green notes add an element of sparkle, evoking memories of springtime. The signature soft white glass, now hexagonal in shape, is filled with a soy-paraffin wax blend, resulting in 60 hours of beautifully scented illumination. Packaged in a luxe hinged box, embellished with a pearlescent croc texture. Each decorative box includes a set of Antica's signature matches. Antica Farmacista Candles are made with a premium, clean burning soy/paraffin wax blend with all-natural, lead-free wicks and provides approximately 60 hours of brilliant fragrant splendor for the home. Created in Antica's signature fragrances and packaged exquisitely, this candle makes the perfect gift for any occasion.